Lee.org » Blog Archive » Finally Automatic Email Followup! Boomerang! Finally Automatic Email Followup! Boomerang! I have been wanting this email feature for oh my god, like 20 years. Thank you internets! 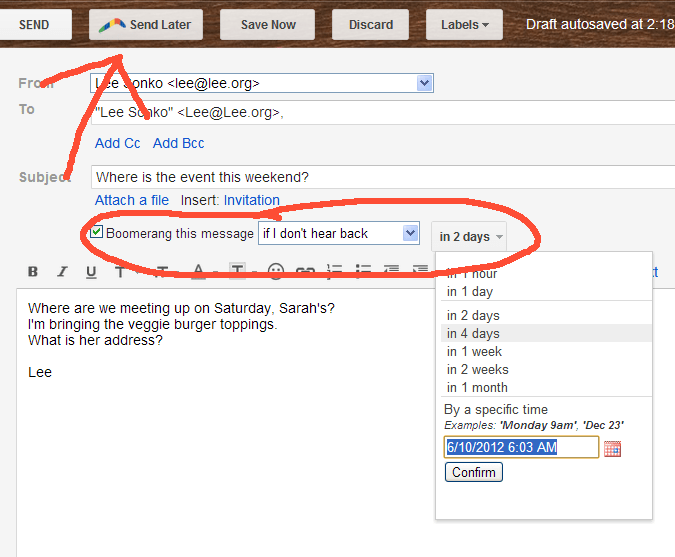 Boomerang for Gmail is awesome! (that is a referral link, if you use it, we both get some free prizes like these. You know when you send an important email and a timely response is important but you aren’t sure the person is going to respond quickly? How do you keep track of this important tidbit? What I used to do was copy-and-paste the email into a Calendar item… which is cumbersome and a PITA to do on a regular basis! I’ve been using it for a week and it works as advertised! I’m in! There is Boomerang for Gmail on Chrome, Firefox, and Safari (Hahah, no Internet Explorer! ), and Outlook too. Groovy, a couple people signed up to Boomerang with my referral link. The thing has already saved me a couple times… I can now “fire and forget” my emails and not actually forget! At the end of my first month they’re going to start charging me $5/month but darn if it isn’t worth it. They let me spin the “Wheel of Prizes” for one referal and gave me 2 days of free service… yeah, whatever. They haven’t let me spin for the other signups yet. We’ll see!